One Year Olds: Everything is new and interesting to one-year-olds. They enthusiastically use their five senses to actively explore the world around them. Their classroom encourages them to make discoveries, recognize simple objects, interact with their peers and teachers, maipulate blocks, stacking toys, and explore their environment. The development of oral language will be fostered through the reading of books, reciting of nursery rhymes, daily singing of songs, and lots of verbal interaction. Children this age make an important developmental leap by beginning to pretend during play, often imitating adult movement. 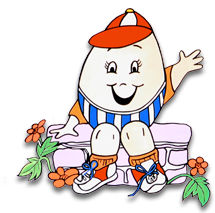 They will also begin to understand common phrases and simple directions used in rountine situations. Everything in this program is designed for enhancing your one-year-old's development and growth. Two Year Olds: The developmental needs of two-year-old children are different from other children. Their classroom, materials, and daily routines reflect these different needs. The program for these younger preschoolers is carefully planned to meet the needs of children who are coming together for the first time. Our emphasis includes encouraging language development, providing opportunities for cooperative play, and helping your child to socialize. Large and small motor activities are planned within a safe and warm environment where your child can "practice" his/her increasing independence; all designed for smaller hands and shorter attention spans. Three Year Olds: This is the age where children are beginning to enjoy cooperative play and to achieve interaction with each other. This program focuses on language activities using books, games, songs, and movement. Dramatic play, block building, and art activities also play an important role at this stage. Children in this program are gaining independence in self-help skills, which is greatly encouraged. 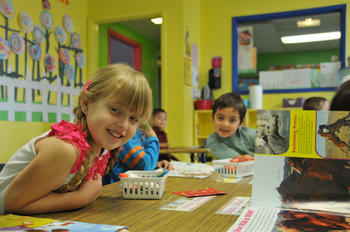 Four Year Olds: Developing natural imagination and curiousity for learning is the key in the four-year-old program. Cooperative play and sharing is encouraged. Daily activities focus on language games, creative arts, storytelling, child-dictated stories, puppets, dramatic play, block building, music and movement, and science and discovery. Gross and fine motor skills are practiced with manipulatives, games, sand and water play, and playground activities. Five Year Olds: Developing fundamental learning skills, problem solving skills, creativity, and an excitement and love for learning are important goals. Activities that focus on letters, letter sounds, numbers, shapes, sizes, and color recognition are a daily part of this program. Our math experiences are a hands-on approach with concrete materials which lay the foundation for later abstract learning. This program stresses many activities to help the children socialize, gain independence, and play cooperatively. 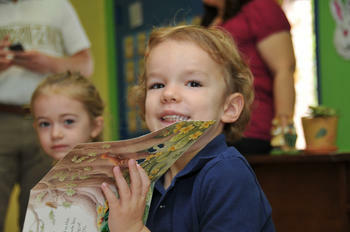 Every January we start our Reading Program with our Pre-K students. Students learn concepts about print, basic reading strategies, and they take home a predictable reading book each week to read along with parents at home. This program has proven to be very successful! 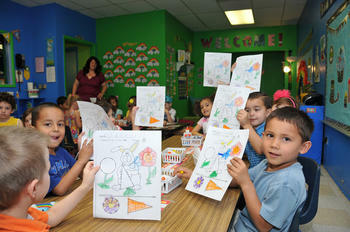 School Age Program: During school vacations and summertime, we have a school-age program. 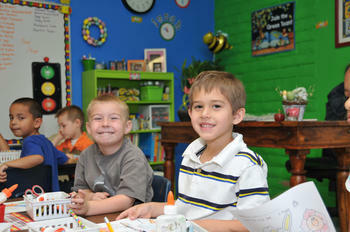 Our school-age program centers around older age appropriate activities. A variety of activities will be offered, such as art, music, games, field trips, painting, drawing, and creative arts. 6:30 am until 5:30 pm.